When earthquake strikes or tsunami occurs, thousands of lives are lost and many heritage buildings or the entire villages are even lost. It would take years and eras to see the lost places surface up. Here are the some of the buildings that have emerged from water. 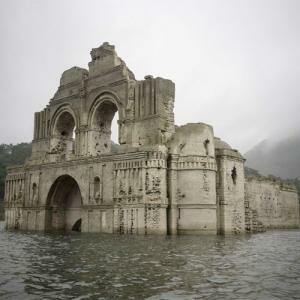 In 2015, the remains of a Colonial-era church emerged from the receding waters of a river in the southern Mexican state of Chiapas. The Grijalva River watershed was hit by a drought this year, which caused the water level in the Nezahualcoyotl reservoir to decrease by 82 feet. The church was built in the mid-16th century by a group of monks.